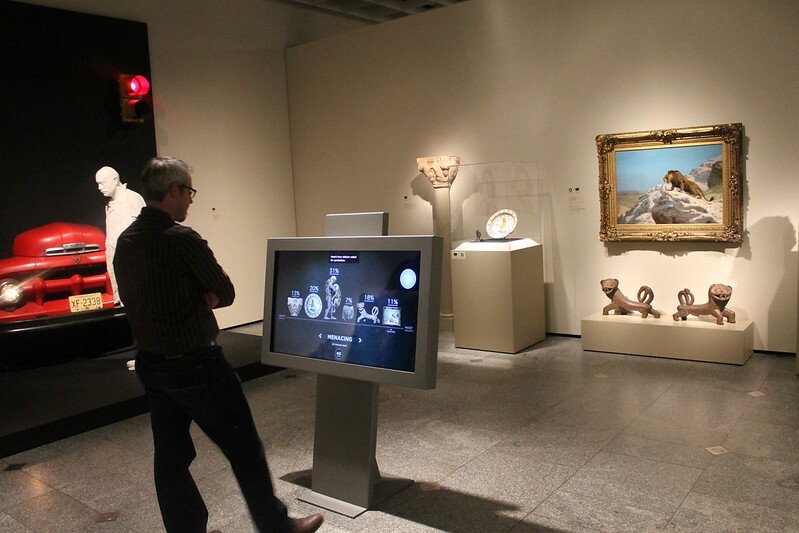 Gallery One includes six interactive kiosks, each positioned near a grouping of collection objects in the gallery to provide interpretation and interaction with the clusters of related artworks. 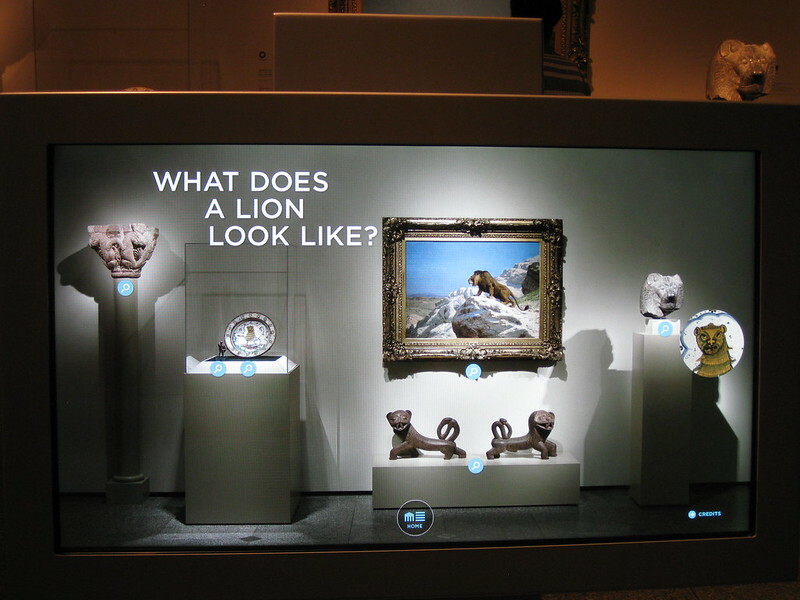 Each of the six interactive lenses in Gallery One is presented on a large-format interactive 46-inch touch screen. Touching any artwork from the group on the screen opens the “Look Closer” interactive, which shows high-resolution images of the artwork, many of which may be rotated 360 degrees and zoomed by touch. The artworks reveal assorted informational hotspots relating to specific details of the work, the artist, era, etc. through slideshows, text, and video. In addition to the “Look Closer” mode, the lenses each have a theme and one or more unique interactive games designed around that theme. In addition, all lenses contain custom coded games relating to the theme of the lens. Visitors can share their results through social media, which also creates a link to the collection records online. 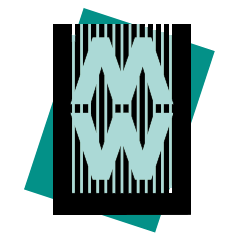 The lens software consists of a unified framework upon which a variety of interactive multimedia, games, and vignettes were built. All six lenses share a similar home screen layout, framing the artworks in front of the lens. The “Lion” installation was the first grouping of artworks that the Gallery One project team interpreted, and represented a significant break-through in conceptual planning for the entire team. The team wanted to develop a thematic arrangement that focused on animals—always popular with a wide cross-section of visitors—with groupings that would allow visitors to investigate modes of artistic representation, from realism to various forms of stylization in artworks across time and cultures. They chose the lion as a familiar animal that visitors could easily recognize when realistically represented, or when rendered in an expressionistic or abstracted way. The museum also had a deep, diverse body of works that reference lions from a variety of perspectives. CMA worked with Local Projects to develop a technology interface that engages visitors with these objects and concepts, using an interrogative and conversational style rather than a didactic one. We used an innovative approach, conceiving of the kiosk as a transparent lens looking into the installation of artworks. We animated the top level of the interface with a question: What does a lion look like? The CMA team loved the simplicity of that question, which was a call to discovery, recognition, and surprise, and became the visitor’s entry point into the interpretive technology. Make a Face: in real time, facial recognition software matches a visitor’s facial expression to artworks within CMA’s collection. The visitor’s expression is captured and the system measures nodal points on the face, distance between eyes, shape of the cheekbones and other distinguishable features. These nodal points are then compared to the nodal points computed from a database of 189 artwork pictures in order to find a match. The matched faces are collected into photo- booth-style strips that are then displayed on the Beacon near the gallery’s entry. The visitor is also able to email their ‘photo strip’ to themselves and share with others. Strike A Pose: The visitor is shown an image of a sculpture in a unique pose and asked to imitate that physical position. A Kinect sensor measures how closely their pose matches the original and assigns a percentage to indicate how well the visitor embodied the sculpture’s pose. The better the match, the higher the percentage achieved. The skeleton matching software uses a library of human-generated skeleton data captured via the Kinect data to quantify the match between the poses of a museum visitor and each sculpture. Visitors can email their image capture, see other visitors’ images, and try another pose. Build with Clay: Visitors can construct their own clay sculptures in the same form as the Japanese Haniwa sculpture on display nearby. The process of creation is presented through an interactive, multi-touch, stop-motion video. Cast a Vote: This activity explores the ideas of realism in representation and of art as a visual language. Polling questions present a progression of thought about what a lion looks like and what a lion means, and aggregates answers in a cumulative interactive infographic. Find the Origin. Visitors are asked to match historical and contemporary popular culture examples to three narrative archetypes that are represented within the artworks in front of the visitor. Epic stories are thereby understood as being retold across different eras and cultures. After five matches, the visitor can watch a chronological sequencing of all the examples within each archetype. Tell a Story. The main plot points of the Perseus myth are extracted from the tapestry hanging in front of the visitor, who can then put them in any linear order to form a story arc within a comic book film. 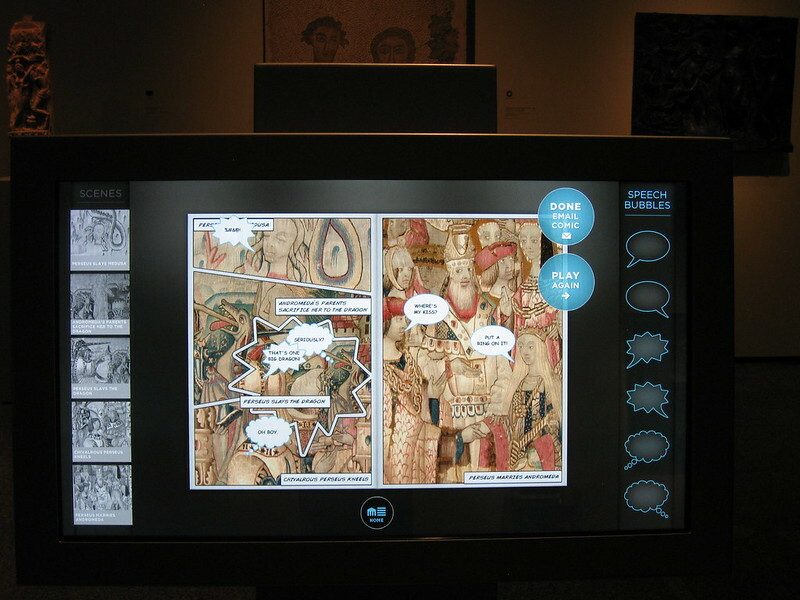 Within the comic book style, visitors can rearrange each narrative plot point within the cells of a typical comic book layout. They are then able to add thought and speech bubbles and add their own text or a provided sample. 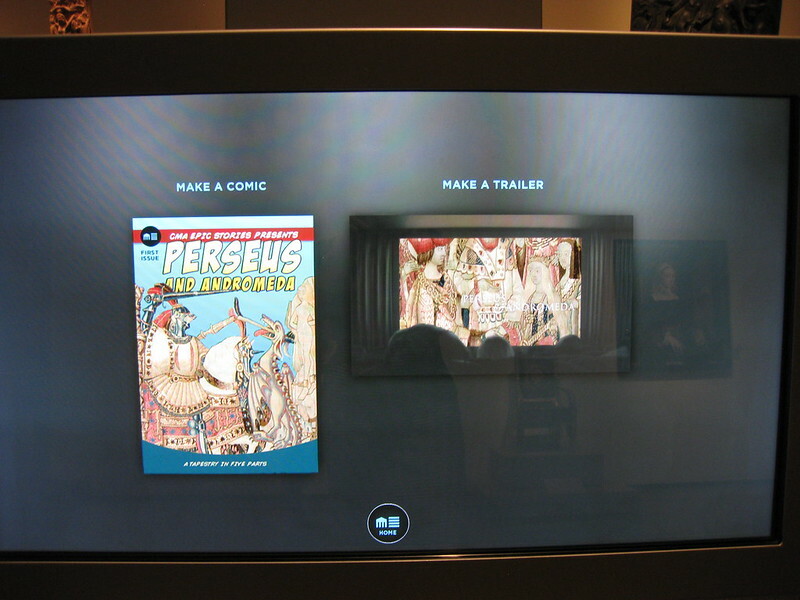 The visitor can then email themselves the Perseus comic they created. Within the film style, the visitor sequences the plot points to select a soundtrack before watching their film in an animation. Global Influences: The visitor is presented with an artwork and asked to guess which two countries on the map influenced the artwork in question. An introductory animation explores the hybridity present within many artworks and design objects, thus calling attention to specific examples of cultural cross-pollination. Create a Vase: Images and text introduce the vase trade between Europe and Asia. The visitor is able to make a vase by progressively building upon chosen options (shape, materials, patterns, and techniques), each of which is assigned a unique price estimate. The final product is showcased alongside a similar vase within the CMA collection to illustrate how techniques and origins affect the artwork’s market value. Draw a Line: This is an adaptation of the ‘Line and Shape’ game located within Studio Play. After a visitor draws a line across the screen, the interactive searches 442 artworks in the CMA’s collection and displays one that contains a similar line. All the artwork within this game was created in the 1930s and contains additional information: Explore the 1930s. What was the world like then? A narrative montage of imagery from the 1930s depression era tells the story of the Great Depression and Cleveland’s role in this period. The information presented gives the visitor a context with which to approach the artwork in the lens and form a deeper understanding of how these artworks fit into the general themes of that era. The film is coupled with quotes from Cleveland artists and an accompanying soundtrack. Choose a Reason: The visitor is presented with a large image of an artwork from CMA’s collection (from a pool of 89 artworks in total) and asked to select one of five reasons they think the painting was created. Once selected, a visualization shows how other visitors in the museum voted, along with a short caption giving further information about that painting and the artist. Make Your Mark: The visitor is presented with three abstract painting techniques, represented by different objects from CMA’s collection. The activity invites users to paint in the style of an abstract artist, exploring the techniques of pour, drip, and gesture as paint color palettes are generated from sample artworks. Visitors can contribute their painting to a collection of visitor-created art on view in the lens. Remix Picasso: Introducing concepts of multiple and flattened perspective, and fragmented forms, the visitor is invited to rearrange abstracted elements or “pieces” of the composition in any way he or she likes, exploring the interplay between flatness and depth. The pieces may be manipulated through multi-touch zoom and rotate gestures. Change Perspective: One-, two-, and three-point perspective is visually presented via animated, morphing perspectival overlays as they are applied to artworks within the collection. The visitor is then able to manipulate a three-dimensional shape, shifting perspective according to touch points across the horizon lines. Discover Tempera: The tempera panel painting by Sano di Pietro directly in front of the visitor inspires a demonstration of the tempera process within the interactive. This visually captivating interactive shows each of the five stages of the tempera painting process at a zoomed-in scale. Each step in the process layers over another, and as a process is completed, the visitor is able to slide the next step over the last, seeing the highly detailed transition and effect of each stage in high resolution. Each stage has an accompanying process video as well. Each lens’s large-format interactive 46-inch touch screen is a 1080p HD display with a 32-point, optically-driven multi-touch overlay. The modular design of the lens housing provides for easy maintenance and minimizes down time. To give the lenses a small footprint in the gallery, the Windows PCs running the software for each lens are located in a remote server room. Audio is supported from a hidden overhead speaker system that utilizes an extremely narrow audio beam to isolate the audio to the 2 meter diameter area centered around where the user would be standing. The sculpture lens uses a Microsoft Kinect to track user skeletons for the “Strike a Pose” game, and a webcam to track faces for the “Make a Face” interactive. The software was written with a mixture of ActionScript 3/Adobe AIR and C++/openFrameworks. Nearly 60% of visitors interact with the lenses in Gallery One: 38% interact with one, 23% each with two or three, 12% with four, and 4% with five. Visitors are most likely to approach the 1930s lens, but overall use of all lenses is rather equal.